Drumroll please for our June Skater of the Month…. #17 The Spread Eagle! #17 is in her fourth season with SRD and is continuously encouraging innovation and growth in our team. Being a leader of innovation and always calling it like it is are not easy jobs and we are incredibly grateful for the effort and love #17 puts into our team and this sport. 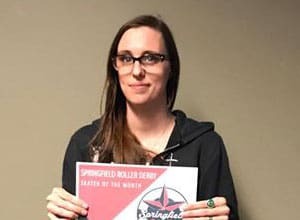 Congratulations to our June Skater of the Month!